Property 9: CONYNGHAM COTTAGE - located at Gladstone SA. Southern Flinders Ranges. Tintookie Vineyard- Fabulous views & lots to do. Property 24: Tintookie Vineyard- Fabulous views & lots to do. Centrally Located in the heart of Goolwa - All Towels & Linen Included! 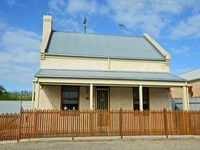 Property 26: Centrally Located in the heart of Goolwa - All Towels & Linen Included! THE STABLES: Heart of Robe. 100m Shops, Beach. LOCATION LOCATION! Property 33: THE STABLES: Heart of Robe. 100m Shops, Beach. LOCATION LOCATION! Excellent property, very inviting, comfortable, well appointed, and bright. Enjoyed a brief stay while we fulfilled a long term goal to explore the Coorong and Murray mouth. We enjoyed exploring Goolwa and its river history, and could highly recommend the nearby first class Whistlestop restaurant. Highly recommended property.